See those 'note' icons that I clunky circled? Those are annotations. Effectively, you add your own notes to the Google Analytics graphs. These notes are an easy way to track activity that may impact the website, but wouldn't automatically be picked up by Google Analytics. Deploy an important change to the registration process? Then make an annotation. Now, when registrations plummet (or soar! ), you'll have some idea of why. It's a simple, yet brilliant way, to add context to Google Analytics that may otherwise be missing. All of a sudden, those peaks and valleys in the graphs may actually have some explanations behind them. It's possible to look up in the ChangeLog exactly what was deployed in that release. 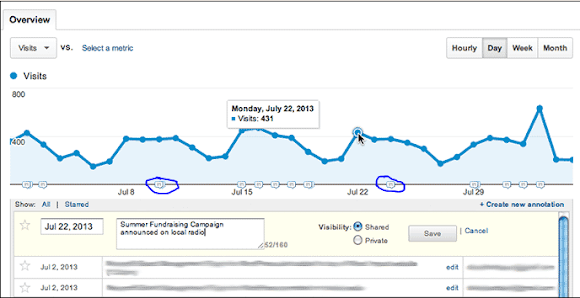 And from there, you can tease out how the changes you pushed impacted your traffic and visitors. Thanks to Teri Ross who introduced me to the concept of Annotations. Litter or Modern Art Piece?